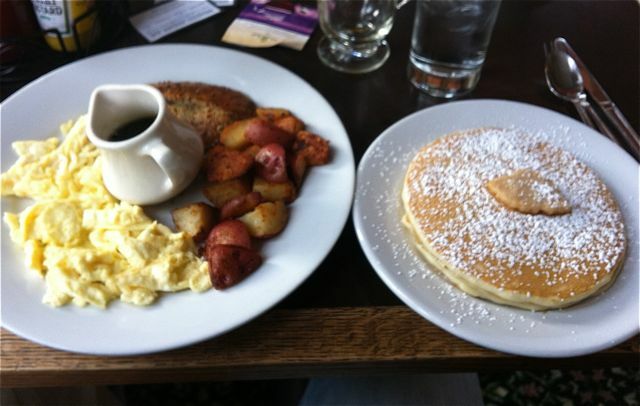 When you stay at Hood River Hotel you get a $10 voucher towards breakfast. The 2 times we have stayed here we have cashed in our vouchers and been very pleased with breakfast. I ordered the Eggs Benedict with herb polenta. 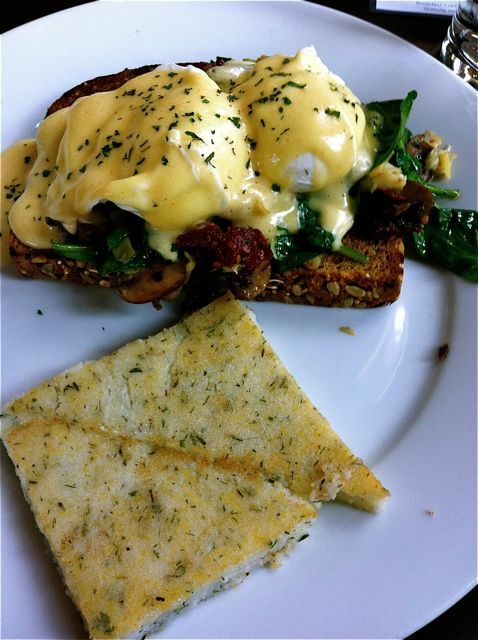 I am always intrigued by something different and many things about this Eggs Benedict were different. Like it was served on hearty toast. It had sun dried tomatoes, which I loved, but a little goes a long ways, so I had to take a few off. The herb polenta was also a great breakfast treat that I also liked. My husband did a traditional breakfast. I always like when he does that because I like to get a taste of pancakes. They were really good. He also had eggs, breakfast potatoes and a chicken sausage. This place is hopping. We recognized people from town, not just people from the motel coming in. Our barista from Dog River Coffee was dining there. That’s always a good sign. Atmosphere is great in this older hotel. It’s open and there is seating in the lobby area near the big fire place. They also had a few tables that had big parties and in the summer you can dine outside. Pricing was pretty reasonable, then with the added $10 voucher it made it a great deal. 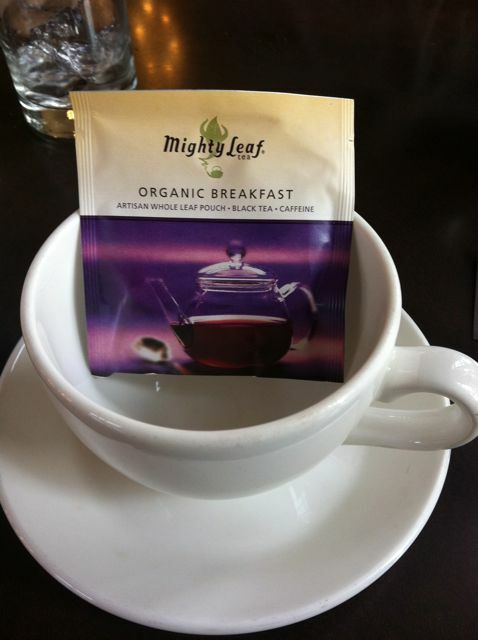 They served Mighty Leaf tea, which makes me happy. Service was great. They were busy, but they stayed on top of things. It is located in the Hood River Hotel. Thanks, Amy, for your kind words about our breakfast menu. We’re proud of it — and all about getting our guests and walk-ins fueled up for a great day of exploring Hood River and surroundings. Eight wine tasting rooms within walking distance of our front door? Stellar. Abundant dinner options, at our Cornerstone Cuisine or, on nights when we are closed for dinner, at Celilo (across the street), Double Mountain Brewing (great pizza, not to mention beer), Nora’s Table (killer international menu), Kaze (yes, very solid Japanese fare) and Mekong Thai just west of downtown. For a little town, we eat extremely well. We did mention beer, didn’t we? Full Sail, Big Horse, DM and numerous tap rooms. Bring your DD (designated driver) or just walk home to us. You do eat well for a little town. Which is why we do many getaways to Hood River!! !